HP LaserJet Pro 400 M401n Printer Full Software and Driver Download for Windows and Macintosh(Mac OS X).The full solution software includes everything you need to install your HP printer. This collection of software includes the complete set of drivers, installer software, and other administrative tools found on the printer’s software CD. Operating System (s) : Windows 7 (32-bit, 64-bit), Windows Server 2003, Server 2008 W32, Server 2008 x64, Windows Vista(32-bit, 64-bit), Windows XP. HP LaserJet Pro 400 M401n Printer Full Software & Driver Download for Windows (95MB). HP LaserJet Pro 400 M401n Printer Basic Driver Download for Windows (38MB). HP Universal Print Driver Download for Windows PCL6 (16MB). HP Universal Print Driver Download for Windows PCL5 (16MB). HP Universal Print Driver Download for Windows PostScript (17MB). This utility is for use on Mac OS X Operating systems. This update is recommended for the HP LaserJet Pro 400 Printer M401n that have a firmware version older than the one posted.This utility updates the printer firmware version to the latest version.The firmware version can be found on the Self Test/Configuration Page which can be printed from the printer’s Reports menu. 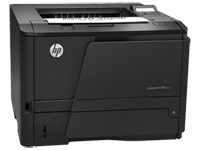 HP LaserJet Pro Series Firmware Update Utility – Download (57MB).